Coming Ashore, Peter Bland (Steele Roberts, 2011), 72 pp., $19.99; This City, Jennifer Compton (Otago University Press, 2011), 64 pp., $30.00. It’s an exemplar of our age that, as the earth becomes more intimate and accessible so conversely the nature of displacement becomes more extensive, and those experiencing migrant life become more disjointed from the concept of ‘home’. It has long seemed to me that poetry is one of the best platforms to voice the complexities of migration. After all, it is poetry – that most expressive, emotional and lyrical of literary mediums – that in its other guise, the most marginalised, best parallels the immigrant’s lot. with so many questions left unasked. disguised as a child… (2). the essence you came from. Growing-up, dying, displacement, memory, story-telling: time and again, poems in Coming Ashore remind us that these are the things we all carry with us, particularly we New Zealanders for whom these affairs are the stuff of our everyday and/or our ancestry. In Coming Ashore, Bland is less charting the individual life in small detail than the big idea told in emotive language. Therein, the book is a joyous celebration of the way in which lives can be lived fully, rather than a series of laments to that which has passed us by. I am travelling from my life, towards my life. (5). back to when kowhai was pronounced kowhai. (6). the past into the future. (7). one hand delving in my shoulderbag. with two ties at the top to keep the knitting safe. (8). As with Coming Ashore, the verses in This City return us to loss, memory and ancestry. 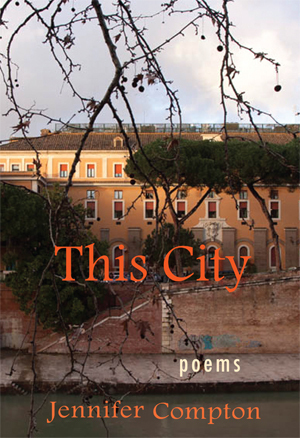 Here Compton’s poems are mythologies we read to better understand how we arrived here and now. ‘Exile is strangely compelling to think about but terrible to experience. It is the unhealable rift forced between a human being and a native place, between the self and its true home: its essential sadness can never be surmounted,’ wrote Edward Said (9). To be isolated from one’s birth country can intensify, emotionally, psychologically, spiritually, physically and geographically, one’s passage through other lands, their communities and value-systems. In their new collections, Jennifer Compton and Peter Bland write richly and extensively about the impact of topographical and personal distance from the place or places they know as home. By reading these books where we learn about what it is to be a contemporary migrant, we also learn what it is to be ourselves, connected to a land forged by ancestral displacement. 1. Peter Bland, ‘Mixed Signals’ in Coming Ashore, Wellington, Steele Roberts, 2011, page 52. 2. Peter Bland, ‘The gift’ in Coming Ashore, Wellington, Steele Roberts, 2011, page 32. 3. Peter Bland, Loss, Wellington, Steele Roberts, 2010. 4. Peter Bland, ‘The groves of Isis’ in Coming Ashore, Wellington, Steele Roberts, 2011, page 55. 5. Jennifer Compton, ‘This City’ in This City, Dunedin, Otago University Press, 2011, page 7. 6. Jennifer Compton, ‘The Threepenny Kowhai Stamp Brooch’ in This City, Dunedin, Otago University Press, 2011, page 24. 7. Jennifer Compton, ‘Street View’ in This City, Dunedin, Otago University Press, 2011, page 39. 8. Jennifer Compton, ‘Lost Property’ in This City, Dunedin, Otago University Press, 2011, page 51. 9. Edward Said, Reflections of Exile and Other Essays, Harvard University Press, 2000, page 173. SIOBHAN HARVEY is the author of the poetry collection Lost Relatives (Steele Roberts, 2011). She teaches at the University of Auckland.